Use this kit to make your own bunkboard boat guide. This kit comes with everything you need except the boards. Use this kit when our standard 5' bunkguide is not long enough. 2 - 11" wide x 12' long rolls of our high quality weather-resistent carpet. Carpet width completely covers a 2"x4" board. 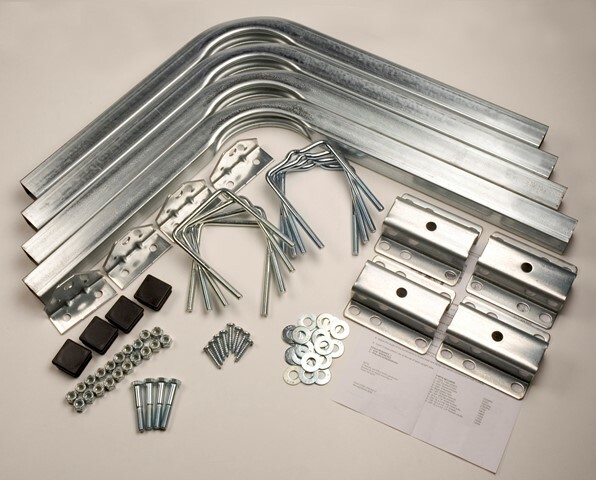 U-bolts will fit trailer frames that are 3" wide x 4-1/2" high. Boards are not included in this kit. From John Lance of Greenville, South Carolina on 5/12/2018 . Heavy duty and well made. Perfect fit. Thanks again. From dale of Inverness, Florida on 3/11/2017 . From Anonymous of San Antonio , Texas on 12/17/2016 . Just what i needed the 90 degree kit fit my 06 kenner perfect all i had to do was buy the boards easy to install good product for a good price thanks c.e smith.